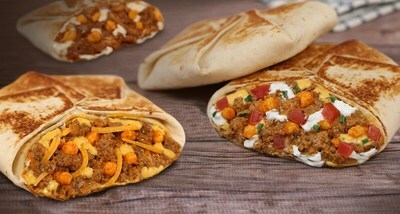 VAUGHAN, ON, Feb. 19, 2019 /CNW/ - What's the only thing that could make the Canadian exclusive revival of the Cheetos® Crunchwrap Slider more exciting, as well as more Canadian? Taking your first bite after barreling down a hill on a snow tube, that's what. On Saturday, March 2, Taco Bell Canada will reinvent the drive-thru experience in honour of Cheetos® Crunchwrap Slider with the world's first Slide-Thru. 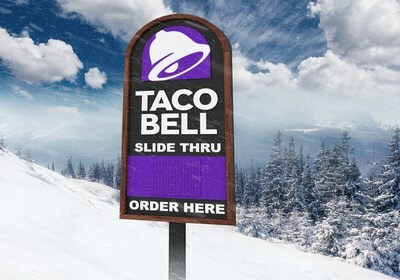 For one day only, Taco Bell fans at Horseshoe Resort near Barrie, ON, will get the chance to place their orders at the top of a tubing hill, slide down and grab their Cheetos® Crunchwrap Slider from a custom-built take-out window at the bottom. Never has picking up lunch been so exhilarating! The Cheetos® Crunchwrap Slider is a Canadian-exclusive combining two fan favourites, Taco Bell and Cheetos® Cheddar Jalapeño cheese snacks. Available only on this side of the border and for a limited time, it comes in three mouth-watering options: Beefy Cheddar, Spicy Chicken, and Supreme. "Unique, exciting and off-the-wall events are an essential part of the recipe that makes Taco Bell what it is," says Veronica Castillo, Head of Marketing at Taco Bell Canada. "This fan-favourite deserves a celebration that's as audacious as the Crunchwrap itself, something wild and unexpected and has never been tried before." Cheetos® Crunchwrap Slider will be available at Taco Bell locations across Canada on February 25, but fans who want the once-in-a-lifetime slide-thru experience can make their way to Horseshoe Resort (101 Horseshoe Valley Rd W, Barrie) on March 2. The slide-thru will be open from 11:30am-2:30pm, with the Cheetos® Crunchwrap Slider available on a first come, first serve basis. Get ready to slide on over! Taco Bell Corp. ("Taco Bell") is a subsidiary of Yum! Brands, Inc. and is the nation's leading Mexican-style quick service restaurant chain. Taco Bell serves tacos, burritos, signature quesadillas, nachos, salads and much more. For locations, information on Taco Bell and to chat with Taco Bell fans, visit us online at our new website www.tacobell.ca or any of our other social channels including on Facebook at www.facebook.com/tacobellcanada, Twitter @TacoBellCanada, on Snapchat TACOBELLCANADA or on Instagram @tacobellcanada.